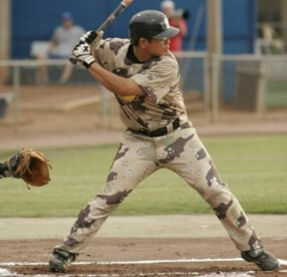 Founded in 1990, the U.S. Military All-Stars are a 501(c) 3 Non-Profit organization dedicated to the proud tradition and growth of military baseball worldwide. Heroes of the Diamond participate while off-duty and cover their own expenses. They decline government funding to ensure all available resources support brave men and women overseas. Their players are selected among thousands of personnel worldwide and represent some of the most talented athletes in the armed forces, the majority have deployed in direct support of the Global War on Terrorism. 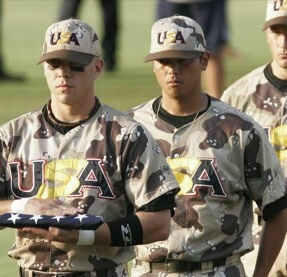 In the modern era of military baseball (Post Vietnam) over 25,000 active duty, reserve and Veterans have participated. 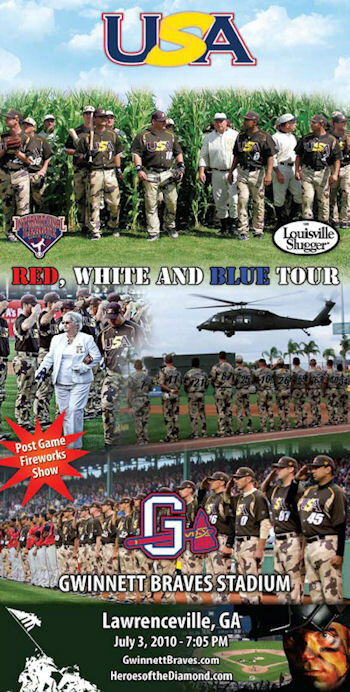 They are the largest, fastest growing, most successful, and only joint armed forces baseball program in the world. The historic "Red, White and Blue Tour of America" visiting over 40 states and 6 countries has become the most popular summer exhibition in the world enjoyed by over 25 million people. They make over 350 appearances annually providing the absolute finest patriotic atmosphere possible. They deliver highly competitive, exciting entertainment, and a once in a lifetime experience to perform on an international stage. Armed Forces Make at the Tip of the Spear"
Copyright © 2013 Gary Bedingfield (Baseball in Wartime). All Rights Reserved.